Russian town in the government of Grodno. It had a Jewish community at the end of the sixteenth century, when Joel Sirkes held his first rabbinate there. The community is first mentioned in Russian documents in 1583 ("Regesty i Nadpisi"). In 1628 the Council of Lithuania adopted a resolution that Pruzhany should be its permanent meeting-place, but the resolution seems not to have been adhered to. The number of its inhabitants in 1817 is given as 824; but it grew fast under Russian rule, and, notwithstanding the almost total destruction of the town by fire in 1863, it had, by 1865, a population of 5,455, of whom 2,606 were Jews. The last census (1897) showed a population of 7,634, of whom about 60 per cent were Jews. The best-known rabbis of Pruzhany were: Abigdor b. Samuel (d. 1771, at the house of his son Samuel, the last rabbi of Wilna); Enoch b. Samuel Schick (went later to Shklov; died about 1800; great-grandfather of Elijah Schick, or "Lida'er"); YomṬob Lipmann (son of the preceding, and probably his successor); Elijah Ḥayyim b. Moses Meisel (about 1860; now  rabbi of Lodz; born at Horodok, government of Wilna, Jan. 9, 1821); Jeruham Perlman (from 1871 to 1883; removed to Minsk); Elijah ha-Levi Feinstein (born in Starobin. 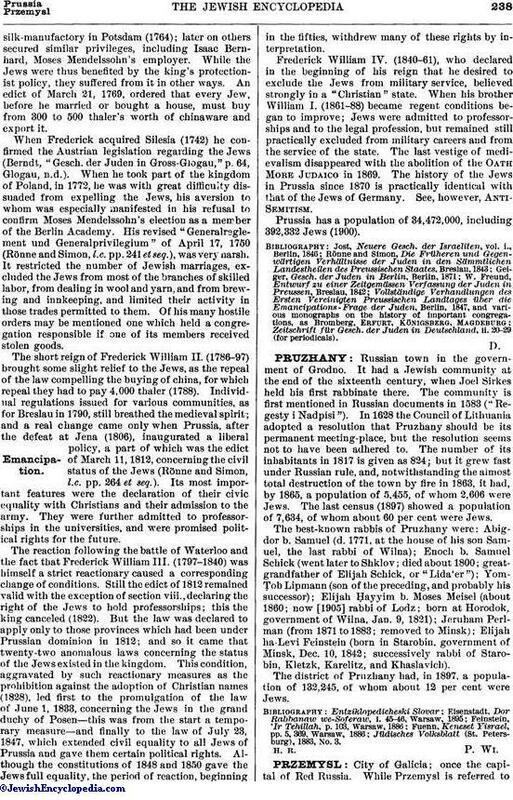 government of Minsk, Dec. 10, 1842; successively rabbi of Starobin, Kletzk, Karelitz, and Khaslavich). The district of Pruzhany had, in 1897, a population of 132,245, of whom about 12 per cent were Jews. Jüdisches Volksblatt (St. Petersburg), 1883, No. 3.